↑ Les Paul, 90, releases tribute album. CBC. October 12, 2005. ↑ "Music Great Les Paul Dies at 94". idiomag. 2009-08-17. สืบค้นเมื่อ 2009-08-21. ↑ Caine, Paul (2009-08-13). "R.I.P. 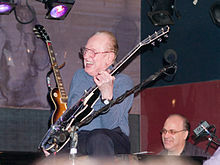 Les Paul: pioneering guitarist, inventor, New York character". The A.V. Club. สืบค้นเมื่อ 2009-08-14. ↑ Tourtellotte, Bob (August 13, 2009). "Legendary guitarist, inventor Les Paul dies, age 94". Reuters. สืบค้นเมื่อ August 13, 2009. NBC radio shows by Les Paul, Mary Ford, and bassist/percussionist Ed Stapleton. At the Internet Archive. Free mp3 files of eleven of their radio shows including their audition show. หน้านี้แก้ไขล่าสุดเมื่อวันที่ 22 กุมภาพันธ์ 2561 เวลา 15:13 น.